Point out your lovely girl with our extraordinary hot pink dog collar FDT Artisan! A pretty pink leather dog collar combines a professional handmade work with the attention to every detail and high-quality strong natural leather. Such combination makes our luxury pink leather dog collar tear-proof, long-lasting and a great supply for daily walk, a dog show or training. The old bronze-like skulls and studs make your doggy unique and stylish. The edges of a pink leather collar for dogs are rounded and polished thus protecting a dog’s skin from irritation and allergy. A strong rustproof traditional buckle allows to attach a dog leash extremely quickly. All decorations are secured with strong inner rivets. A luxury pink leather dog collar is packed in a beautiful box so it can be an excellent gift idea for your pet or for a doggie man. Choose the exceptional quality! Get a chic hot pink dog collar FDT Artisan at the affordable price from the producer directly! Fancy design with an adjustable belt buckle is a perfect solution for your lady dog. 3 mm thick and 1.6 in wide leather belt. Soft and strong leather that becomes more flexible during wearing. Elegant design with skulls and decorative brass studs add individuality to a dog. All materials are selected according to the International Standards of Quality. They are non-toxic and dog-friendly. Rustproof hardware of a pink leather dog collar make a dog collar extremely durable and reliable. 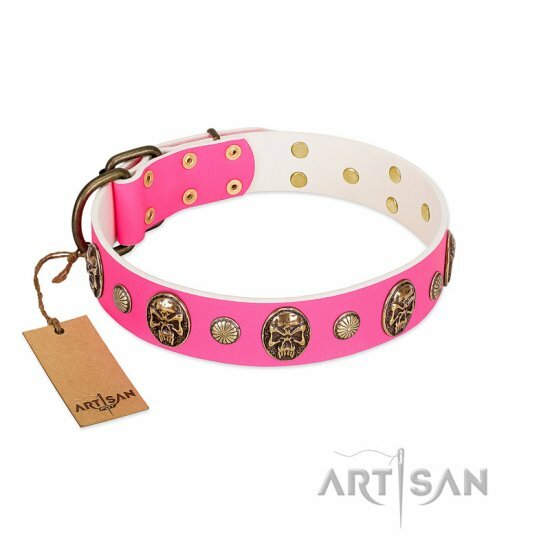 Pink leather dog collar with brass ornaments looks very stylish and chic.